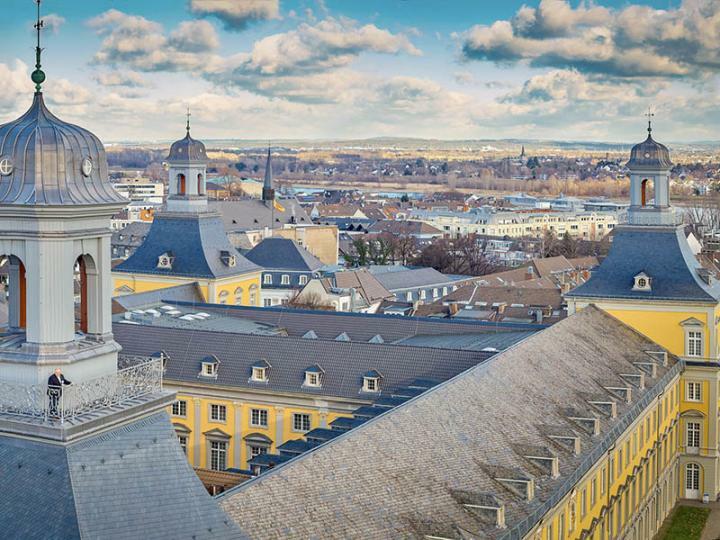 The University of Bonn received with great euphoria the commission's decision to fund six Clusters of Excellence at the University of Bonn – more than any other university in Germany. The clusters are in the fields of mathematics, immunology, dependency research, robotics, economics and quantum physics and represent the entire spectrum of the university's subject range. Rector Prof. Dr. Dr. h.c. Michael Hoch says in a first reaction it is a "sensation". The decision gives the University of Bonn "tailwind on its way to becoming a University of Excellence". Rector Hoch received the news together with many colleagues, including fellow-representatives of the cluster initiatives, staff, junior researchers and students. They all gathered in the new auditorium in Bonn-Poppelsdorf to watch the live broadcast of the funding decision press conference. Elated and surrounded by jubilation, the rector says: "It is a sensation! The great efforts of recent years have paid off! I thank everyone who has contributed. This is above all a communal success, fitting in well with the motto of our 200th jubilee year "Us". It is a collective effort of the entire university and will inspire us on our way forward." Hoch adds: "It is a big step on our way to becoming a University of Excellence. That is our end goal." In December, the University of Bonn will submit its application for the funding program "Universities of Excellence". Which universities will succeed is decided in July 2019. Almost exactly a year ago, the Joint Commission of the German Research Foundation (DFG) and the German Council of Science and Humanities asked the University of Bonn to submit full applications for seven excellence clusters – more than any other German university. The seven interdisciplinary projects covered the university's broad spectrum of research areas. From January 1, 2019, the Clusters of Excellence will receive funding of up to ten million euros per year for an initial period of seven years. In total, 57 cluster initiatives received funding commitments today. With six clusters, the University of Bonn is the most successful university in Germany. A panel of experts in science prepared the decision. Today, the Excellence Commission, consisting of the panel of experts and federal and state ministers responsible for science and research, met in Bonn. During a press conference on late Thursday afternoon, the funding decision was made public. The funding of joint Cluster's of Excellence further strengthens the so-called ABC region of science (Aachen, Bonn, Cologne including Jülich), says Rector Professor Hoch: "The ABC region is already one of the most research-intensive metropolitan regions in Germany and Europe. Today's decision will help to increase the international visibility of this science region." Professor Hoch said: "I would like to thank all supporters who have contributed to this huge success – in the city and at the state level, and our non-university partners, the Fraunhofer-Gesellschaft and the Max-Planck-Gesellschaft, Forschungszentrum Jülich and the German Center for Neurodegenerative Diseases DZNE. " Rector Professor Hoch is very pleased about the funding decisions: "Researchers, administrative staff and the rectorate have been working for months with all their strength on the excellence strategy. I would like to thank all those involved for their commitment and congratulations on the six projects that are now being funded. "Today, this success will be celebrated", says the Rector, adding, "but tomorrow, we will continue to work, because in December we want to present a convincing application that can stand up to fierce competition. We are now heading into this crucial phase of the excellence competition with tailwind! " Note to editors: We would like to invite you to a press conference tomorrow, Friday, September 28 at 11am in the auditorium center on campus Poppelsdorf. With newly focused research objectives and new appointments, the cluster Hausdorff Center for Mathematics: Foundations, Models, Applications will build on the success of the current cluster and establish a worldwide leading institute for cutting-edge mathematical research in Germany. The goal is to identify and address mathematical challenges of the 21st century, to advance groundbreaking fundamental mathematical research worldwide, and to develop the mathematical methods and tools required by science and society. It is supported by a team of internationally distinguished scientists with highest honors and awards, such as Prof. Dr. Peter Scholze the youngest winner ever of the Leibniz Prize and recent winner of the Fields Medal. This cluster is at the forefront of advancing young mathematicians and building a global network, together with the world's best research and education centers for mathematics. Cluster speaker is Prof. Dr. Karl-Theodor Sturm. The identification of important players and functions of the immune system and two extremely successful biotech spin-offs are among the outstanding achievements of the current funding phase for this cluster. With "ImmunoSensation2: the immunosensory system", Bonn researchers want to continue the success story of the existing Cluster of Excellence "ImmunoSensation". While the emphasis so far has been on fundamental research in particular of the innate immune system, now the mechanisms of immune intelligence are to be uncovered, i.e. the question of how the body succeeds in adapting immune responses to specific situations and then remembers this in order to be optimally prepared for similar challenges in the future. This can help predict and treat autoimmune diseases as well as chronic infections, atherosclerosis, diabetes, tumors and Alzheimer's disease. Cluster speakers are Leibniz prize winners Prof. Dr. Gunther Hartmann and Prof. Dr. Eicke Latz and Prof. Dr. Joachim L. Schultze. Dependency research has almost exclusively dealt with slavery on the American continent or in antiquity. The cluster "Beyond Slavery and Freedom: Agency within Asymmetrical Structures of Individual and Group Dependencies in Pre-modern Societies" seeks to broaden this perspective in terms of content, space and time. The cluster strives to become an internationally visible and renowned center for dependency and slavery research. Its main contribution will be to bring together an extraordinary network of academic disciplines. The University of Bonn is ideally suited for this endeavor with its wide range of so-called small subjects. A fellow program, a graduate school, a postdoctoral program, the establishment of an international master's program and a global research network will provide a new generation of researchers. Anyone who wants to do research in this field in the future should first think of Bonn. Cluster speakers are Prof. Dr. Stephan Conermann, Prof. Dr. Karoline Noack and Prof. Dr. Konrad Vössing. One of the big goals of our society is to fight hunger, improve agriculture and make it more sustainable. One of the major challenges is to increase crop production despite limited land use and while reducing the environmental footprint. In order to achieve this, the University of Bonn together with Forschungszentrum Jülich are conducting research in the cluster "PhenoRob – Robotics and Phenotyping for Sustainable Crop Production" to develop methods and new technologies that observe, analyze, better understand and specifically treat plants. Fields are monitored from the air as well as from the ground. Computers process this sensory data so that robots can automatically treat individual plants. The aim is to make agriculture more efficient, to gain new knowledge about plant growth and to avoid the use of chemical aids. The concentration and network of internationally renowned researchers in geodesy, computer science and agricultural sciences in Bonn is unique and, in this form, not available at any other location. Cluster speakers are Prof. Dr. Cyrill Stachniss and Prof. Dr. Heiner Kuhlmann. This cluster, together with the University of Cologne, is the only predominantly economics focused application that made it into the second round of the Excellence Strategy. Researchers want to analyze the causes of market failure and resulting policy measures. Unlike traditional analyzes of economic policy, researchers systematically combine model-based theoretical approaches and behavioral explanatory models, incorporating legal and political framework conditions. Thus, the interdisciplinary working groups include new societal challenges and goals and offer solutions using new instruments that have so far barely found their way into economics and economic policy. How do you measure and deal with market power in the digital age, when many offers are virtually free of charge and instead are paid for by the provision of data? What are the consequences for consumer protection? What influence do preferences for fairness or justice have on the design of minimum wages or inheritance taxes? Can and should individual behavior be controlled by instruments such as nudging, if this seems to be for the benefit of the individual? These are just a few of countless questions being raised in this cluster. Cluster speakers are Prof. Dr. Isabel Schnabel and Prof. Dr. Felix Bierbrauer. Over the last few decades, computer hardware has become smaller and smaller, but their technology remains more or less the same. Slowly, this development is reaching its limits. Thus, we need new technologies that satisfy our growing hunger for even more powerful hardware. Quantum physics could be a solution. Together with the University of Cologne and the RWTH Aachen, Bonn researchers want to work on making this new technology usable. This achieve this, quantum bits or even qubits – the quantum counterpart to our previous bits – quantum communication channels that build networks and error correction methods have to be explored from the ground up. Cluster speaker is Prof. Dr. Yoichi Ando.